Here are pictures of the pretty pink and gray princess nursery that we recently decorated for our baby girl. We feel that the room is a feminine yet functional space that can grow with our daughter from infancy through the toddler years. 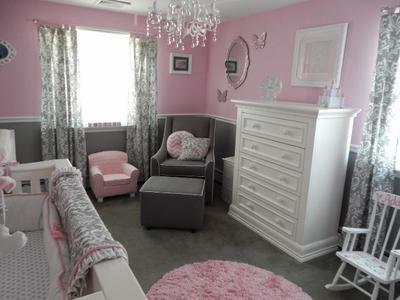 The nursery's colors are simple, yet elegant resulting in a room that is very regal and yes, fit for a princess. We skipped over the butterfly and flower themed baby bedding that we found in Babies R Us and Buy Buy Baby and chose a damask baby bedding set that we saw online that we really fell in love with instead. To choose the paint colors and decorative accents, we worked off the fabric and colors of the crib set. Knowing that the gray and pink nursery color combination is the new brown and pink that was so popular a few years ago, we created a design within the space that was original and unique. 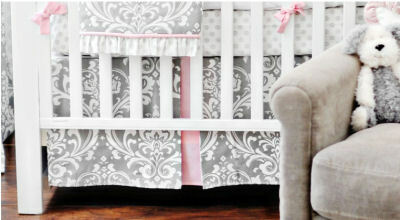 Go here to see pink and grey damask crib sets for your project. We chose a combination of classic, traditional and vintage decor rather than a theme although a pink and gray elephant theme nursery would have been very cute. We had a tough time finding furniture that was truly "WHITE". Most of the collections were called French white, vintage white or ivory which all had a yellow tint to the finish. I wanted bright white furniture and continued to look until I found this beautiful set. This pink chandelier is covered in sparkling beads and faceted glass crystal. Lighting is so important to create the desired atmosphere in a room and this fixture was perfect. I ordered the round pink nursery rug from Amazon.com. I received both of the chairs as gifts at my baby shower. However, I do know the pink one came from Toys R Us. These items were purchased from Hobby Lobby and Bed, Bath and Beyond. To make the Addison blocks I used 4 inch blocks purchased from AC Moore, painted them with acrylic craft paint and added the embelishments with a hot glue gun. I found these on Etsy at a price of $11 per block and decided to just make them myself! My favorite items in our baby girl's nursery are the furnishings. It was important to find white furniture because I really wanted a match to the wooden chair rail and white trim. I knew the white furniture and trim would break up the pink and gray walls and felt that it complemented the elegance of the damask baby bedding set. My next favorite item in the room is the chandelier. It's pink and perfect for my little princess' room! My advice when designing a nursery is to first pick a crib set or fabric and work from there. Choose a colors and furniture styles that will match the fabric. Please visit the gallery of baby girl nursery pictures featured by Unique Baby Gear Ideas to get more ideas for decorating a little princess nursery. I love the whole room, but I absolutely love the crib, where did you get it? Grey is now my favorite neutral color! It can be paired with both pink and blue and I'm using it to paint the walls of my nursery for baby No. 1 since I can use it for baby No. 2 when he or she arrives. The paint is Benjamin Moore, The pink is "Pink Cherub" and the gray is "Stormy Monday". The Crib and both dressers are made by Munire and the name of the set is "Capri". What pantone is this pink on pink and gray nursery?